NCAA Loses Court Ruling In Athletes' Antitrust Case : The Two-Way A federal judge sided with college football and basketball players who say they're being used to help sell video games, TV broadcasts and other content without being paid. 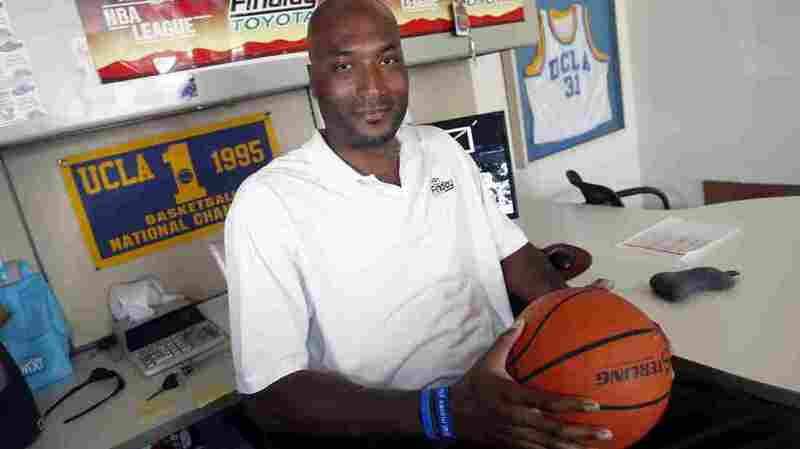 Former UCLA basketball player Ed O'Bannon, seen here in 2010, has won a court ruling in which the NCAA was told it can't forbid college athletes from being compensated for the use of their images and names. The NCAA violated antitrust laws when it said college athletes couldn't be compensated for the use of their names and likenesses, a federal judge ruled Friday. U.S. District Court Judge Claudia Wilken sided with a group of current and former college football and basketball players who say they're being used to help sell video games, TV broadcasts and other content without being paid. Led by former UCLA basketball player Ed O'Bannon, the group filed a lawsuit in 2009. "It went from being flattered that I was on the video game to, you know, somebody's getting paid. I know I wasn't. So, I just kind of thought at that particular time something needed to be done." Today's ruling follows a three-week trial in June; it's subject to appeal. In her ruling, Wilken rejected the NCAA's stance that its "restrictions on student-athlete compensation are necessary to uphold its educational mission and to protect the popularity of collegiate sports." Wilken said that the NCAA's rules "unreasonably restrain trade in the market for certain educational and athletic opportunities offered by NCAA Division I schools." The judge acknowledged that the NCAA had proven that some restrictions on compensation can benefit universities and students as well as consumers — but she also said the organization could pursue those goals through "less restrictive alternatives." Those alternatives might include two proposals offered by the plaintiffs. One idea is to use licensing revenue to give students stipends to cover their education expenses. Another is to have schools hold the revenue in a trust for the student athletes until they leave school. In addition, the judge said the NCAA can set a cap on the amount of compensation students can receive while they're in school — but the limit can't be below the cost of school attendance. A cap is also allowed on money held in a trust, but it must be at least $5,000 for each year of academic eligibility. "With respect to competitive balance, for instance, the NCAA could adopt a more equal revenue distribution formula. As noted above, its current formula primarily rewards the schools that already have the largest athletic budgets. This uneven distribution of revenues runs counter to the association's stated goal of promoting competitive balance."